Cheesy roasted parmesan zucchini is a great low carb side dish that’s easy to make. These are delicious, healthy and highly addictive! Yummy, low carb goodness is what these are! Roasted parmesan zucchini spears are one of my absolute favourite low carb side dishes. These are super addictive and can also be eaten as a healthy snack. So I guess that makes it one of my favourite low carb snacks too! 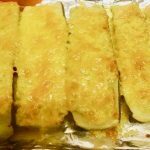 These amazing zucchini spears are keto approved and great if you are following a ketogenic diet. The spice mixture in this recipe give these amazing flavor and even the fussiest eater will be asking for seconds. I usually make a big tray of these because they disappear so quickly. I love making healthy recipes that the kids love to eat. You can also cut these into bite sized pieces for younger children for a quick snack or lunch. These are great to make during harvest season when zucchinis are plentiful. Be sure to use a baking rack on top of your baking sheet when you make these. It will prevent your zucchini from becoming too soggy while cooking. You want your end result to be crispy and tasty! Also feel free to add any toppings to these that you desire. Some people like to turn their zucchini spears into pizzas. To do that you’d just have to add some low sugar pizza sauce or marinara sauce and pepperoni if desired. Have fun and make this recipe your own by adding some ingredients you think you’ll love! I also have a recipe for mini pizzas made out of zucchini that you may like. Check out Mini Zucchini Pizzas to see how they’re made! Sounds yummy. Going to try it. I have made these and they are delicious!